Like a comet blazing across the night sky, Isaac Newton’s theories on celestial movement and gravity scorched the fusty intellects at the Royal Academy in 1683. His young scribe, Humphrey, is caught up in the rollicking race to change how the universe is perceived. He finds that even the greatest of men must overcome personal tragedies to achieve success. Through Newton, Humphrey learns that knowledge is what enriches existence and civilization - a lesson he shares later in life with his students and son. We see events through the eyes of a young boy named Isaac Newton, who provides a voice-over narration and occasionally appears to speak directly into the camera. Young Isaac is no relation to the famous Isaac Newton, but his father, Humphrey Newton, was once the great man’s protege--and therein lies Young Isaac’s tale. The story begins in rural England with the birth, on Christmas Day, 1642, of the future Sir Isaac Newton. When he is three years old, he is left in the care of his grandparents when his widowed mother remarries and moves away. Isaac feels profoundly abandoned. By the time he is a teenager he has retreated into a solitary world of scientific study and invention. At age 18, he attends Cambridge University and, as the action jumps ahead, by age 35 is an esteemed mathematics professor there. Cut to: young Isaac’s father Humphrey as a 15-year-old. In many ways he resembles professor Isaac--studious and inventive--but with one crucial difference: he is in tune with his romantic streak and rather fancies Clara, the niece of his school’s headmaster. One day, the great Newton visits Humphrey’s school, which he once attended himself. The headmaster introduces the two unrelated Newtons--professor Isaac and star pupil Humphrey. Newton agrees to hire Humphrey as his assistant. The headmaster also introduces Newton to his stepdaughter Catherine. Sparks of a sort fly. But whereas Humphrey is in tune with his feelings for Clara, Newton is befuddled by his attraction to Catherine. Newton has been trying to explain mathematically the movement of the planets. On a walk in a nearby orchard one day, a falling apple provides him with an intellectual epiphany and the first inklings of the concept of gravity. Newton is eager to pursue the idea back in his Cambridge quarters. He persuades Humphrey’s father to let the young man accompany him. Humphrey is loath to leave Clara, but the prospect of working with Newton prevails over his emotions. By now, Catherine has become emotionally attached to Newton. With their romantic destinies unresolved, the two men depart for Cambridge. There, work proceeds feverishly--Newton thinking aloud, Humphrey struggling to keep pace as his scribe. Newton’s ideas are too revolutionary for many at the university, and his lectures are not well attended. Humphrey urges the great man to pursue a wider audience by publishing his findings, but Newton, ever fearful of rejection, demurs. Humphrey surreptitiously arranges for the Royal Society, England most prestigious scientific organization, to invite Newton to speak. Newton’s address has an instant--and divisive--effect on the members of the Society. Professional jealousies are rampant. The likes of Robert Hooke and Christopher Wren dismiss Newton’s laws of motion and universal gravitation, while astronomer Edmond Halley is cautiously intrigued. Halley, Wren and Hook are obsessed with learning more about Newton’s work. They take Humphrey out for a night on the town, and in a weak moment Humphrey divulges more than he should. This leads to a wager: the first man to produce mathematical proof that the planets travel in an elliptical orbit wins a prize. Newton is working harder than ever, but for Humphrey, science has lost its lustre. He misses Clara terribly, and his father’s illness provides him with the excuse to go home. Newton is left to his own devices--until Halley comes calling. He believes in Newtons work and wants to see him win the wager. At that moment, Hooke and Wren are stealing Newton’s notes. But all is not lost. Newton realizes that Humphrey has inadvertently left with another, more complete set of notes. He and Halley elude Hooke and Wren and race by carriage back to Woolsthorpe. En route, Newton explains his now fully developed mathematical laws. If he can collect his notes, he will win the wager. Humphrey mistakenly believes that Clara is about to get married. He interrupts what he thinks is her engagement party and clumsily declares his love. Newton and Halley arrive just as Catherine declares that it is her engagement party, not Clara’s. Humphrey realizes that he will be able to fulfill his destiny: to marry Clara. With gently mixed feelings about Catherine’s future, Newton realizes that his loyalty is to his work. He and Humphrey return to Cabridge, hammer out his law of motion and theories of universal gravitation, and see them published to great acclaim. 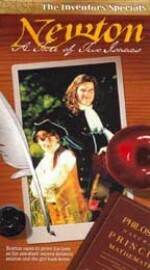 Newton wins the wager, and, with Newton’s blessing, Humphrey returns home to win the hand of his beloved Clara. The result of their union is Young Isaac, who wraps up the film with one final observation. Isaac Newton was born in the early hours of Christmas Day, under the sign of a comet and in the same year--1642--that Galileo died. His father had died three months earlier, and when his mother remarried, moved away and left young Isaac to the care of his grandparents in Woolsthorpe, Newton was stricken with profound feelings of abandonment that forever influenced his ability to trust and deal comfortably with other people. As a young boy, shy and introspective, he preferred to be alone, sketching and tinkering with inventions; at age 12, he made a perfect working model of a famous windmill near his school. Water clocks, sundials and kites fascinated him, and he demonstrated a precocious aptitude at mathematics. At age 18, he was accepted at Cambridge University where he was to spend most of the next 40 years, first as a student, then as a professor. But for all his genius and productivity, Newton was notoriously publicity shy - disinclined to publish his theories lest they attract discussion or criticism that would require him to engage in public debate. When the Great Plague broke out in 1666, he retreated to the less populated haven of his hometown, Woolsthorpe, and, fittingly, enjoyed the most intensely productive period of his life. (He later called it his "miraculous year.") His fundamental obsession was his certainty that celestial motion--indeed, all motion--was governed by mechanical laws, not mysteriously heavenly forces, and it was his determination to prove this theory that led to his many discoveries. After the plague subsided, Newton returned to Trinity College, Cambridge, and in 1671, finally consented to have his first work published. As he expected, he was soon drawn into the orbit of the Royal Society, a hotbed of scientific thought, and as he had equally feared, rampant egos. Whereas Samuel Pepys, (an early Society president), had been a strong supporter, Robert Hooke, the Society’s secretary, proved to be something of a nemesis - going so far as to accuse Newton of plagiarising Hooke’s work. Conversely, his relationship with astronomer Edmond Halley was an extremely positive one; Halley encouraged him to publish The Mathematical Principles of Natural Philosophy ("The Principia"), which some say remains the most influential scientific book ever written. Today, most every schoolchild knows the significance of the Newton-and-the-apple story: that Newton went on to articulate the law of gravity and then the three laws of motion. Less widely appreciated are his other contributions to understanding our universe--that he invented differential and integral calculus, made the first reflecting telescope, and discovered laws of optics, fluid mechanics and cooling. In the early 1690s, Newton suffered what would now be called a nervous breakdown. His considerable fame by then was a mixed blessing, representing long-overdue recognition of his genius at the same time as imposing on him responsibilities that must have been onerous for someone so emotionally insecure. Still, he rose to the challenges and opportunities that presented themselves: successfully running for Parliament, becoming Master of the Royal Mint (for which he was knighted) and eventually assuming the presidency of the Royal Society. Unfortunately, the intellectual backstabbing of his peers, including the unresolved charges of plagiarism, dogged him to the end. In 1727, after a lifetime of generally good health, he suffered a brutally painful case of gallstones, which led to fatal complications. In light of his remarkable contribution to human understanding, Newton was buried in Westminster Abbey.